As Chesterfield’s 97-year stay in the Football League comes to an end, the Spireites now face a whole world of new issues in non-league. As well as going on without a certain future, the club is forced to continue without fans’ favourite Jack Lester at the helm, with the former striker mutually agreeing to depart the Proact Stadium alongside his assistants. Monday was a tough day for all supporters of the Blues with Lester’s departure confirmed, along with numerous other members of staff, but they will need to prepare for a league which they’ve never experienced before. Outside of the EFL, being a ‘big club’ has no foothold in success. Followers of Torquay United would know that more than anyone else, with the former League One and Two outfit being officially relegated to the National League South – their lowest ever level – on Saturday. 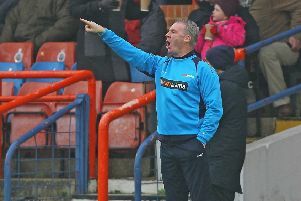 Despite the Gulls being one of the National League’s biggest clubs, they had struggled to even finish in the top half of the table, and a 1-1 draw at Hartlepool United – again, a fellow former League club who are new to the non-league – on the weekend confirmed their drop below England’s fifth tier for the first time in their history, after only four seasons of being absent from the Football League. It’s even harder not to notice the demise of Leyton Orient, a club which shares similarities with Chesterfield. Orient were on the cusp of the Championship when they reached the 2013/14 League One Play-Off Final, cruelly losing out to Rotherham United in a penalty shoot-out after holding a two-goal lead. After losing to Paul Cook’s newly-promoted Chesterfield on the opening day of the following season, Orient’s steep slide down to the non-league began, and the loss of their Football League status was confirmed two seasons later with the O’s rock bottom of League Two. The sale of the London club to the Eagle Investments consortium, led by Dunkin’ Donuts and Baskin’ Robins owner Nigel Travis, ended the three-year fiasco with controversial Italian owner Francesso Becchetti. Consequently, the club have managed to deploy the parachute before dissolvement could become a reality, with the O’s sitting in 13th position with two games of the National League season remaining. Returning the focus on Chesterfield, while the phrase ‘no case is the same’ couldn’t be truer, it would be wise for Spireites supporters to heed the warnings of the ever-loyal followers of Orient, Hartlepool and Torquay, whose experiences of the National League have been all but pleasant. Financially, there is much less support for ex-Football League sides dropping into the non-league bar the parachute funds from the EFL. Sponsorship deals are less wholesome, lower home gates at the Proact Stadium are inevitable, and consequently it will be harder than ever before to turn a healthy profit, a feat which the club has already struggled to produce over the past few seasons with only player sales and financial support from outgoing owner Dave Allen keeping the club on its feet. Fans will need to be patient too if the club is to make its return to the English Football League. Macclesfield’s miraculous promotion season, under one of the National League’s smallest budgets, was six years in the making. Tranmere, meanwhile, have yet failed to achieve automatic promotion within three seasons on one of the league’s biggest budgets, although promotion is a possibility with Rovers’ play-off semi-final place booked. Considering Chesterfield’s budget is unlikely to match the top of the table, it will take strong leadership to ensure a swift return to League football. Away days for next season will divide the opinions of Spireites supporters. Atmospheres are most likely to be poorer with the National League’s average attendance this season being just over 2,000, in comparison to League Two’s average of 4,400. On the plus side, there are plenty of new away days to look forward to, including newly-promoted Salford City, although the away day line-up may not please all supporters. Competition-wise, fans will dread having to qualify for the FA Cup First Round for the first time in Chesterfield’s history – the possibility of not being in the First Round draw is itself hard to stomach. Perhaps they won’t miss being in the Carabao Cup draw, though. The last time the Spireites progressed past the opening round was in 2006 – we can for sure give that a miss for a few seasons. We’ll also be saying goodbye to the Checkatrade Trophy whilst opening the doors to the FA Trophy. Whether or not that’s a positive change is up for debate, though access to the prize money for the newly-reformed Football League Trophy would have been handy. And, of course, player recruitment will be harder than ever before at the Proact Stadium. title-winning team in such a tough division. It’s ironic that Chesterfield were once one of the many Football League outfits cherry-picking from the non-league, but will now be one of the many National League sides fighting to keep the best of their ranks – it would be wise to keep an eye on developments concerning young midfielder Joe Rowley. All in all, no matter what is said by fans of former Football League sides about the divisions below, nothing can truly prepare the Chesterfield faithful for what’s to come in a division they have never experienced before. What can be known for sure, however, is that the Spireites’ National League campaign will be far from blue skies and plain sailing.